Perhaps the title of this post seems ridiculous to some of you. But it will make more sense after reading a book by Gilsa Barcellos and Simone Ferreira of the World Rainforest Movement, focusing on the gendered impacts of monoculture eucalyptus plantations on women, and also the women-led protests against the eucalyptus industry in Espírito Santo, Brazil. 1) There is a vibrant women’s movement centred around protesting agribusiness – in the words of the report, these women are diverse; “rural and urban, white and black, indigenous women and quilombolas“. The next day, the protestors marched through the city of Pelotas. 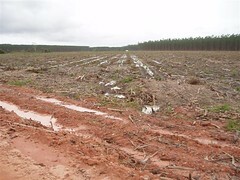 According to the women who led up the action, the impacts of monoculture plantations in Rio Grande do Sul are already visible: the serious drought in the south of the state, where eucalyptus production is most prevalent; the abrupt changes in temperature; the disappearance of the pampa or temperate grassland biome, leading to the loss of extraordinary biodiversity; the decrease in food production; the drying up of water sources; the pollution and reduced water level in rivers; and the reduced fertility of the soil. Some cities have had to begin rationing water to make up for the shortage. In the regions most affected by monoculture plantations, there have been numerous cases of allergies and skin ailments provoked by the heavy use of agrotoxics by the corporations involved. These regions have also seen the growth of poverty and unemployment, which has given rise to increased violence and an exodus from rural areas. In terms of specific impacts on women, in areas where monoculture plantations are most prevalent, an increase in prostitution has been observed. Many families move to other areas in search of employment. In the meantime, new workers come to the region, drawn by the companies’ advertising campaigns and promises of job creation. This has led to the formation of groups of workers without families, often unemployed, which has spurred the emergence of brothels around agroindustrial operations. that’s the way it was. You would take a big piece of cloth to make a net, and you would leave your children there while you weeded and planted the crops. Anyway, this is a brief glimpse, really I would encourage everyone to go read the full report.